Add two RS232 serial RJ45 connections to a PC or Server through USB, with this DIN Rail and wall-mountable adapter. 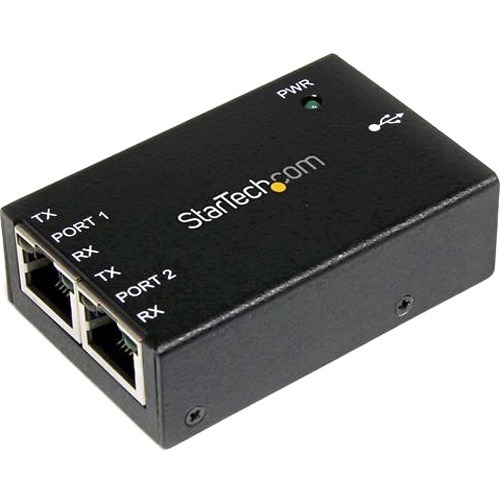 The ICUSB2322RJ 2-Port Industrial USB to Serial RJ45 Adapter (Wallmount and DIN Rail) allows you to add two RS232 serial connections using RJ45 signaling ports to a PC or Server through a single USB 2.0 port.The RS232 to RJ45 adapter features COM port retention to maintain your port number assignments across a reboot and supports serial data rates up to 921 Kbps. The included DIN Rail clips (Top Hat) and wall-mounting brackets provide simple solutions for out of the way installations, while the sturdy metal enclosure offers durability in harsh industrial environments.